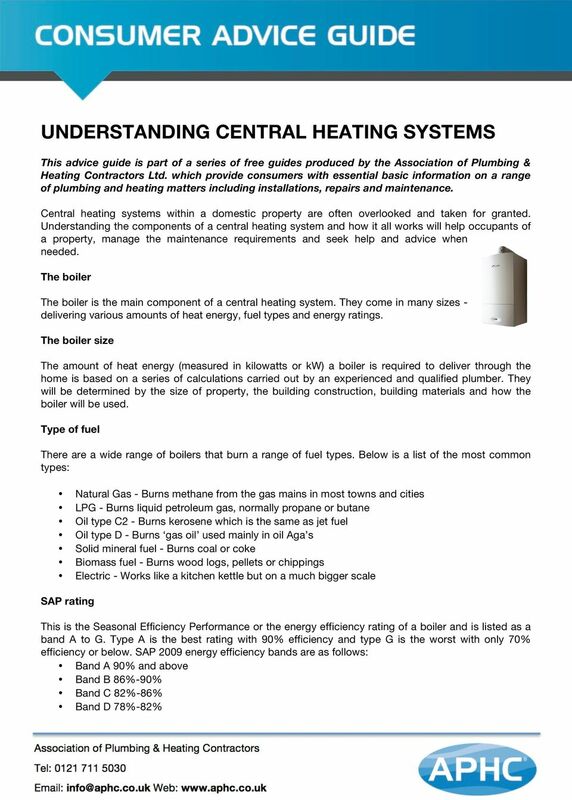 Download "UNDERSTANDING CENTRAL HEATING SYSTEMS"
2 Band E 74%-78% Band F 70%-74% Band G Below 70% The Building Regulations ensure that only the highest possible energy efficiency boilers are fitted and prevent low efficiency boilers being fitted. Types of boiler Conventional boiler - This boiler is the most basic type, it just burns fuel to make heat for central heating or hot water. System boiler - This boiler provides central heating only or heating and a store of hot water in a hot water cylinder (tank). Condensing -This boiler uses the heat in the gases given off when the fuel is burnt; this reusing of normally wasted heat makes some of the steam in the waste gases condense into water giving this boiler its name. Combination boiler - This boiler provides central heating and instant hot water. 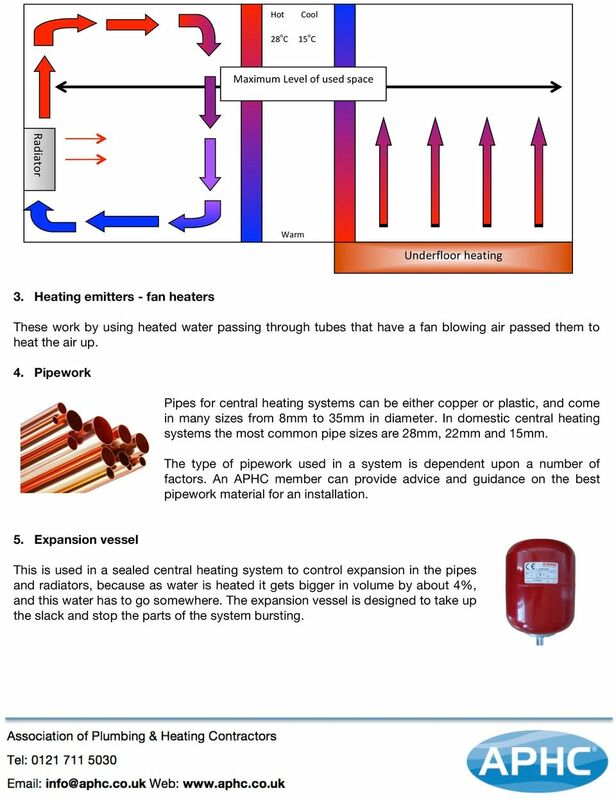 Other components of the central heating system 1. Heating emitters - radiators The radiator is the most common way of heating your home. There are many types of radiator, many are made from copper or aluminium but most are made from steel. A radiator works by transferring heat to the air in the room as it passes over the radiator panel. Warm air rises and pushes colder air back down and over the radiator surface again. 2. Heating emitters - underfloor heating Underfloor heating is a set of plastic pipes that are often run under a solid concrete floor surface and use the floor itself to heat the room, by radiating heat upwards. This type of heating will generally, only be fitted during a new build or extension or conservatory added to an existing property. Consideration will have to be given to the floor covering, tiles and wooden floors are ideal, however, deep pile carpets may have an adverse effect on the heating performance, acting as an insulator. 3 Hot Cool 28 o C 15 o C Maximum Level of used space Radiator Warm Underfloor heating 3. Heating emitters - fan heaters These work by using heated water passing through tubes that have a fan blowing air passed them to heat the air up. 4. Pipework Pipes for central heating systems can be either copper or plastic, and come in many sizes from 8mm to 35mm in diameter. In domestic central heating systems the most common pipe sizes are 28mm, 22mm and 15mm. The type of pipework used in a system is dependent upon a number of factors. An APHC member can provide advice and guidance on the best pipework material for an installation. 5. Expansion vessel This is used in a sealed central heating system to control expansion in the pipes and radiators, because as water is heated it gets bigger in volume by about 4%, and this water has to go somewhere. The expansion vessel is designed to take up the slack and stop the parts of the system bursting. 4 6. Expansion relief valve This valve is also part of the sealed heating system. It is designed to operate if there is a problem with the expansion vessel or the system is over pressurised. This operates to remove pressure from the system. 7. The header tank Plumbers call this little water tank (found in a loft or a high place) a feed and expansion tank. Its job is to top up your central heating system with water, and if your system overheats it provides somewhere for the hot water to go. It is part of an open heating system. 8. The Pump The pump is a part of your central heating system, without it the water heated from the boiler wouldn t go anywhere. This part can sometimes be located inside the boiler or can be found in your airing cupboard. 9. Motorised Valve This component is responsible for choosing where the water from the boiler goes. The valves have a motor attached to the top so they are able to control the flow of heating water to either the central heating or hot water system. They come in two main types, 2 port or 3 port valves. 10. Central heating controls Controls are the brain of the central heating system, with sensors and valves, the controls come together to make the system work. 11. Boiler thermostat A boiler will usually have a dial on it, marked in numbers or from Min to Max. This sets the temperature of the water that will be pumped from the boiler through the radiators to heat your home. 12. Programmer/timer The programmer/timer controls the flow of hot water to the radiators or hot water cylinder (if fitted), and it also decides to turn the system on or off depending on the temperature in the rooms and the time of day. 5 13. Room thermostat Individual room thermostats in your house measure the temperature of the air in the room, if it is cold it will tell the central heating to turn on, when it gets too warm it tells the central heating to turn off. Room thermostats need a free flow of air to sense the temperature, so they must not be blocked by curtains or furniture, or put near heat sources. 14. Thermostatic radiator valves (TRV) These work in a similar way to the room thermostat, the TRV senses air temperature around them and turns the radiator on or off and regulates the flow of water through the radiator they are fitted to. They do not control the boiler directly. Fitting the components together to make Central Heating Systems Central heating systems come in generally three combinations. 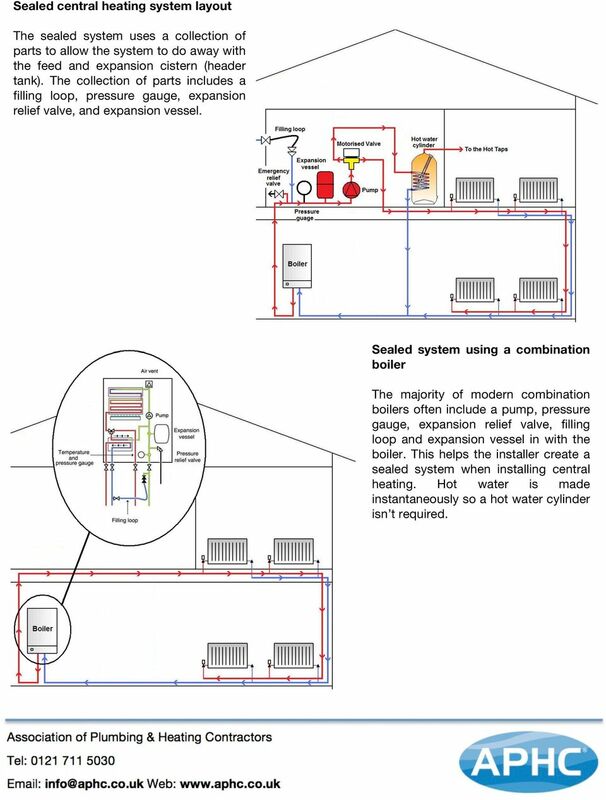 Open vented system using a hot water cylinder, a sealed system using a hot water cylinder and combination boiler systems. 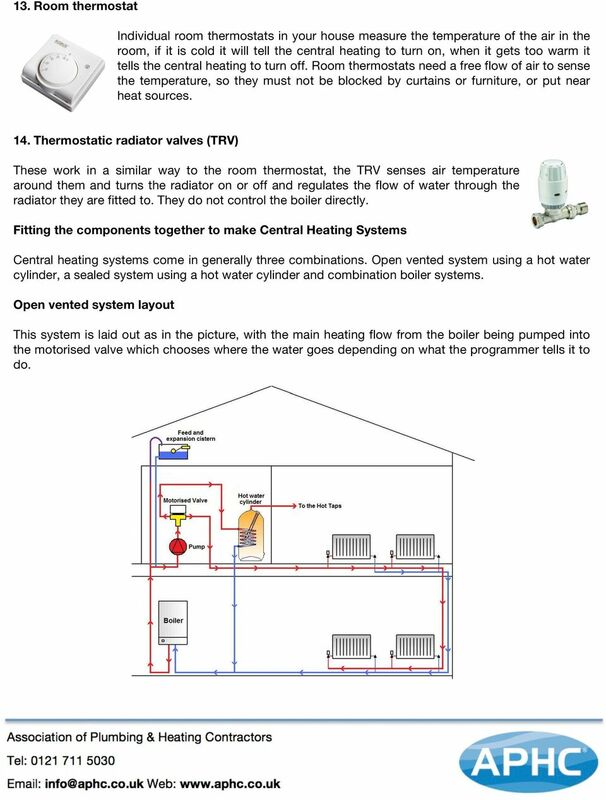 Open vented system layout This system is laid out as in the picture, with the main heating flow from the boiler being pumped into the motorised valve which chooses where the water goes depending on what the programmer tells it to do. 6 Sealed central heating system layout The sealed system uses a collection of parts to allow the system to do away with the feed and expansion cistern (header tank). The collection of parts includes a filling loop, pressure gauge, expansion relief valve, and expansion vessel. Sealed system using a combination boiler The majority of modern combination boilers often include a pump, pressure gauge, expansion relief valve, filling loop and expansion vessel in with the boiler. This helps the installer create a sealed system when installing central heating. 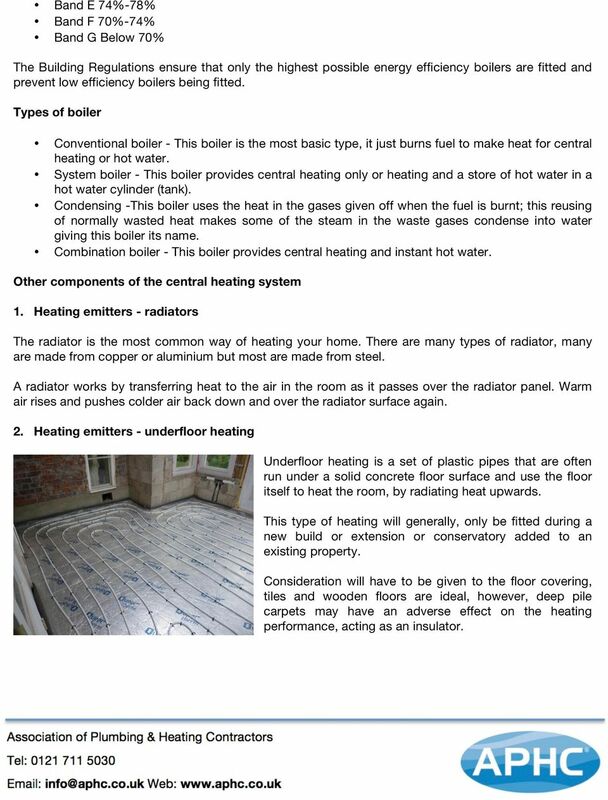 Hot water is made instantaneously so a hot water cylinder isn t required. 7 Considerations when choosing a type of central heating system. 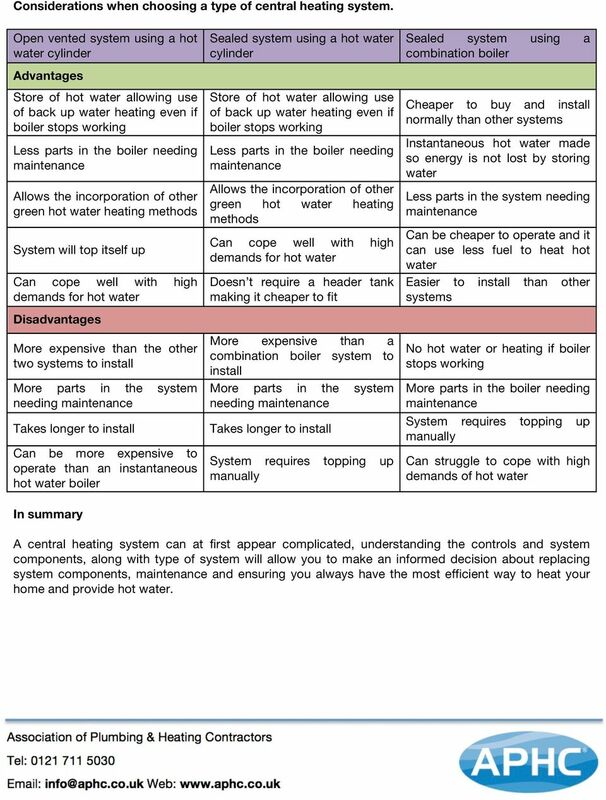 Open vented system using a hot water cylinder Advantages Store of hot water allowing use of back up water heating even if boiler stops working Less parts in the boiler needing maintenance Allows the incorporation of other green hot water heating methods System will top itself up Can cope well with high demands for hot water Disadvantages More expensive than the other two systems to install More parts in the system needing maintenance Takes longer to install Can be more expensive to operate than an instantaneous hot water boiler In summary Sealed system using a hot water cylinder Store of hot water allowing use of back up water heating even if boiler stops working Less parts in the boiler needing maintenance Allows the incorporation of other green hot water heating methods Can cope well with high demands for hot water Doesn t require a header tank making it cheaper to fit More expensive than a combination boiler system to install More parts in the system needing maintenance Takes longer to install System requires topping up manually Sealed system using a combination boiler Cheaper to buy and install normally than other systems Instantaneous hot water made so energy is not lost by storing water Less parts in the system needing maintenance Can be cheaper to operate and it can use less fuel to heat hot water Easier to install than other systems No hot water or heating if boiler stops working More parts in the boiler needing maintenance System requires topping up manually Can struggle to cope with high demands of hot water A central heating system can at first appear complicated, understanding the controls and system components, along with type of system will allow you to make an informed decision about replacing system components, maintenance and ensuring you always have the most efficient way to heat your home and provide hot water. 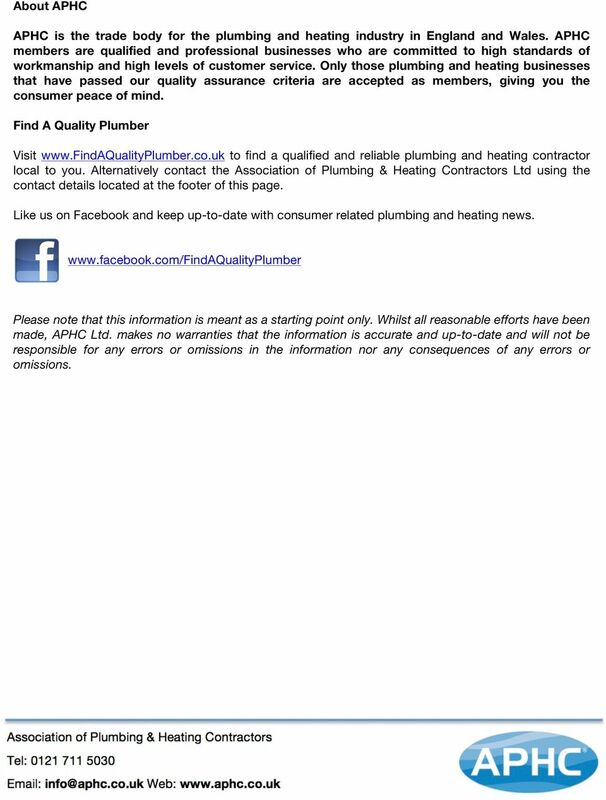 8 About APHC APHC is the trade body for the plumbing and heating industry in England and Wales. APHC members are qualified and professional businesses who are committed to high standards of workmanship and high levels of customer service. Only those plumbing and heating businesses that have passed our quality assurance criteria are accepted as members, giving you the consumer peace of mind. Find A Quality Plumber Visit to find a qualified and reliable plumbing and heating contractor local to you. Alternatively contact the Association of Plumbing & Heating Contractors Ltd using the contact details located at the footer of this page. Like us on Facebook and keep up-to-date with consumer related plumbing and heating news. Please note that this information is meant as a starting point only. Whilst all reasonable efforts have been made, APHC Ltd. makes no warranties that the information is accurate and up-to-date and will not be responsible for any errors or omissions in the information nor any consequences of any errors or omissions. Handy hints. 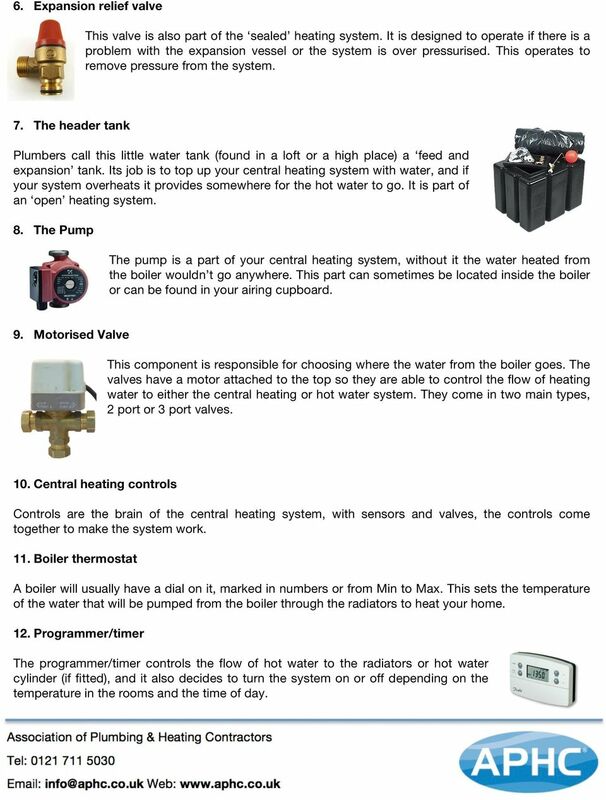 Your heating and hot water guide. Why worry about your hot water system? Jaspi ThermoStore. Jaspi ThermoStore systems have multiple flow / return and thermostat connection points for easy installation and flexibility. Ground source heat pump guide. Why Vaillant? Because we re digging deep to find the heating products of tomorrow. HEATING FACTORS IN THE CHOICE BETWEEN RADIATOR, UNDERFLOOR AND RADIANT PANEL OPTIONS. Date; 17 th July 2012 TITLE; HEATING FACTORS IN THE CHOICE BETWEEN RADIATOR, UNDERFLOOR AND RADIANT PANEL OPTIONS. Heating factors in the choice between Radiator, Underfloor and Radiant Panel options. 211001 043 GENERAL 1. GENERAL SPECIFICATIONS 211001 044 211001 2. FASTENER TIGHTENING SPECIFICATIONS 211001 045 OVERVIEW AND OPERATION PROCESS 1. COMPONENT LOCATOR 1. Reserver Tank 2. Deaeration Tube 3.